EGCSA provides open access to reference material that may be useful to all those interested in exhaust gas cleaning systems. This includes guides to promote standards. EGCSA also undertakes and sponsors research work linked to sulphur in marine fuels and associated emissions. These reference papers and studies are available to download below. BP Marine in co-operation with P&O Ferries installed a flue gas scrubber system into the channel ferry “Pride of Kent”, operating between Dover (UK) and Calais (France). 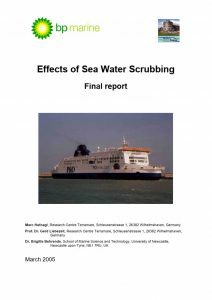 This report by Terramare Research Centre, Germany and the University of Newcastle, UK details the analysis of the overboard discharges and their influence on the marine environment, especially that of the ports. Complete the grey boxes in this useful spreadsheet from Langh Tech to illustrate scrubber payback periods. The spreadsheet allows three scenarios to be developed based on a range of HFO, 0.5% LSFO and 0.1% MGO prices entered by the user. Entering ship engine data and the vessel’s operating profile provides scrubber running costs (OPEX) based on fuel consumption and sulphur content. Entering component and installation costs, provides repayment times for the scrubber investment. Repayment is based on the price gap between HFO and low sulphur fuels. The EGCSA Handbook refers to 2009 Guidelines for Exhaust Gas Cleaning System MEPC.184(59), now superceded by 2015 Guidelines for Exhaust Gas Cleaning System MEPC.259(68), which are available as part of MARPOL Annex VI from IMO publications. Section 7 and Appendix I regarding scrubber vendors have also been superceded and EGCSA members should be contacted directly for details of their Exhaust Gas Cleaning Systems. This is a large publication and the time for the print facility to become fully enabled will depend on the speed of internet connection. The configuration of a simple manual valve arrangement to obtain representative samples from the centre line of a pipe. The Guide is free to download. In partnership with Euroshore, EGCSA has undertaken 2 scrubber water analysis programmes for the European Sustainable Shipping Forum (ESSF). Based on the experience of sailing with vessels to take samples for the first programme, EGCSA has produced a practical guide to scrubber water sampling for ship staff, which has been used during the second programme. The Ship Guide is freely available to download and use as a model for other scrubber water sample analysis programmes. It is focussed on taking samples for analysis of EPA 16 priority PAHs (polycyclic aromatic hydrocarbons) and selected total metals. This version is non laboratory specific. CO2 emissions related to the fuel switch in the shipping industry in Northern Europe.